What does that have to do with a new Slayer album?, you ask. Let’s briefly recap: Reign in Blood, the undisputed quintessential Slayer album, was released in 1986. In 2013, original drummer Dave Lombardo, who left the band for nearly a decade (1993-2001, with the exception of a brief return in 1997) was fired and guitarist Jeff Hanneman died of liver failure. By their own admission, remaining original members guitarist Kerry King and bassist/vocalist Tom Araya have since considered hanging it up on more than one occasion – and, having performed the same fan favourites night after night for nearly 30 years, who could blame them? The Slayer-ity, then, aside from being an admittedly lousy pun, is the moment when Slayer will do something so unlike Slayer that our understanding of the band will be forever and irrevocably changed, and Repentless may to suggest that it won’t be long now: however one chooses to hear it, what is apparent is that, without Hanneman, as new principal guitarist and songwriter King is more pissed off than ever – but does that anger translate into music that will rally the troops with the same fervour as it has in the past? 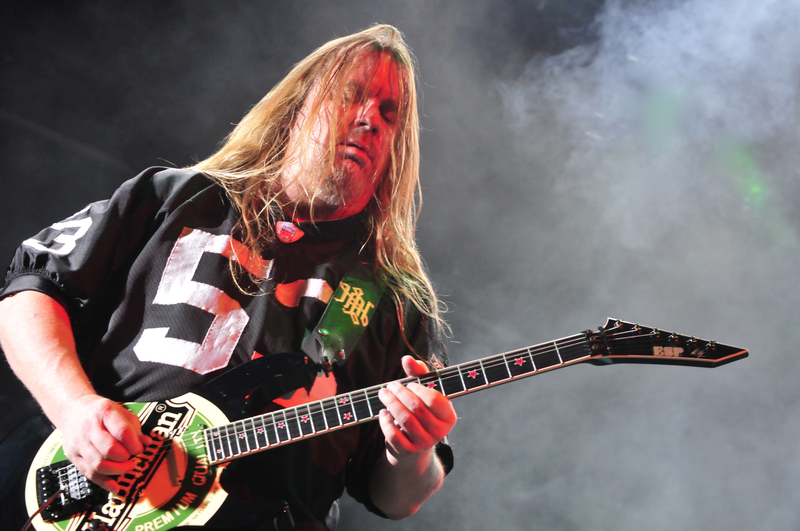 At least part of his anger is no doubt a reaction to the loss of Hanneman (i.e. “Vices”, “Chasing Death”), his friend and songwriting partner of 20+ years, and perhaps to the conflict with Lombardo, as suggested by “You Against You”. While this grants several of the new songs necessary verisimilitude, and despite the energetic and enthusiastic contributions of relative newcomers Gary Holt (guitar) and especially Paul Bostaph (whose technical proficiency as a drummer is stunning), the album only offers tried-and-true Slayer riffage in different configurations rather than anything genuinely new and different. 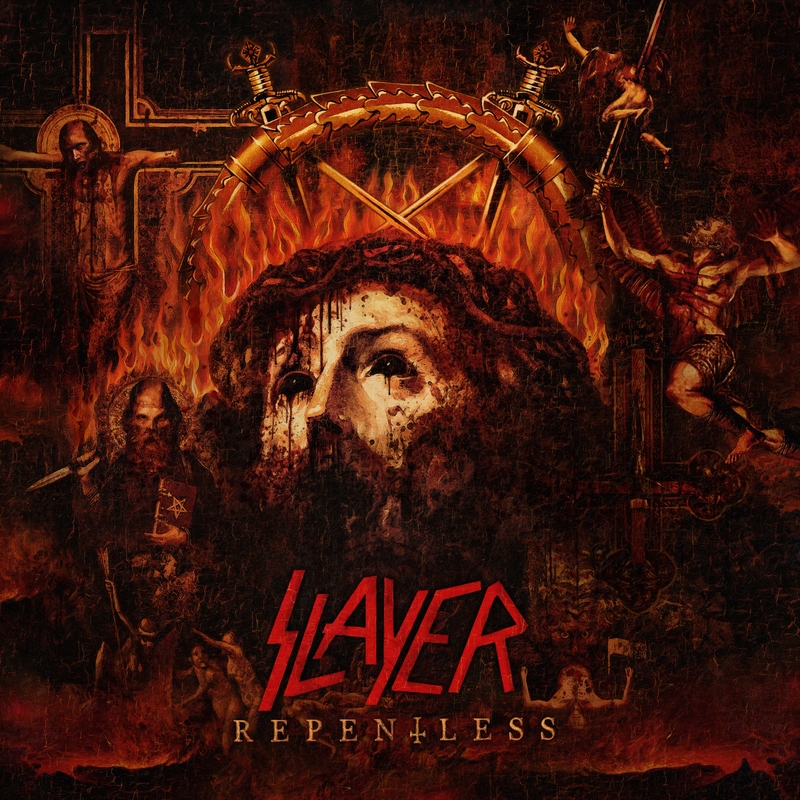 That said, there is nothing wrong with any of the 12 tracks on Repentless, and they do grow on one – it’s taken a week of daily listening to overcome the novelty and settle into familiarity, which is where one would argue that Slayer belongs anyway – as a dependable constant, a venerable institution of metal. King pulls no punches with his latest litanies of contempt and disgust, and the frenzy of “Implode” – which is certainly in the spirit of classic thrash mayhem – recalls the fearsome Slayer of old, when songs such as “War Ensemble” were a clarion call to unite the metal tribes against warmongering violence and injustice (a reference to the financial industry on “Implode” is a welcome addition to the usual indictments). Railing against church and state, hypocrisy and the darkest recesses of human nature have always been staples of Slayer lyrics, perhaps best exemplified by creeping evil slow-burners like “South of Heaven” or new track “When the Stillness Comes”, but the vocal highlights on Repentless come when Araya sings King’s most nihilistic lyrics on “Vices”, “Chasing Death”, and “Implode”. As the first album since the death of Hanneman (and Lombardo’s ousting – again), Repentless is both an end and a beginning. One could say that it’s a return to form, but more accurately, it’s a replica of familiar forms. One can hear that the events they’ve experienced have affected them – and of course they would, no one is immune to time’s passage – but in producing work that retains the spirit and the sound of Slayer circa 1986, their new beginning sounds a lot like a band preparing to end on a high note. Repentless will be released on Friday 11 September 2015.